Since the beginning of time, God has been working in the world to establish His Kingdom. This is the story we are told throughout the Scripture. Kingdom Chronicles is a "chronicle," or an account of events in order, of the Kingdom of God that draws out the narrative portions of the Bible and presents them as a continuous story. You'll follow along as God creates the earth and breathes life into human beings and watch Him fulfill His promises to a small family that eventually becomes a great nation. You'll see how He saves the entire world through Jesus' birth, death and resurrection, and how the good news of His Kingdom spreads through the work of the early Church. 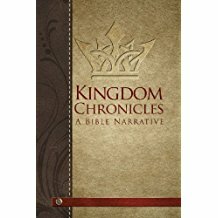 With its approachable style, this is a useful tool if you are new to studying the Bible or if you want an overview of the entire plot and major themes. In Kingdom Chronicles, you will find a faithful retelling of the Bible, highlighting stories in chronological order from Genesis to Revelation.